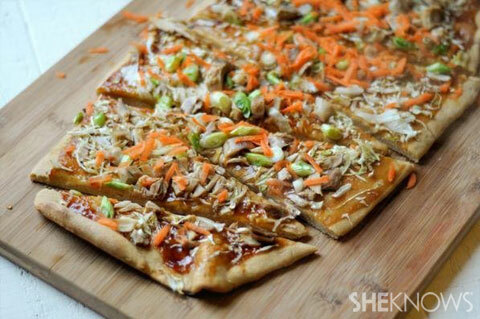 Teriyaki chicken pizza is Asian-fusion at its finest. Sweet and salty, with a little heat, this is one pizza you'll never have to order out for! Spread the teriyaki sauce on top of the pizza crust. Sprinkle the pizza evenly with the cabbage, then the chicken, then the green onions. Bake for 10 to 12 minutes until the crust is crisp and brown on the bottom. Remove the pizza from the oven and sprinkle evenly with the shredded carrots. Cut into even slices and serve hot.